A primal rumble emerges from the mouth of the instrument. On a stony hill in Bambari, deep in the heart of the Central African Republic, 14 other horns start to sound, each with a unique hum, and an impromptu polyphonic concert gets underway. The musicians -- clad in clothes made of bark that are called kundou -- mark the rhythm with a rolling step, shaking their alikposso, little bells made of palm leaves attached to their ankles. Local people emerge from their homes, delighted to hear something that is not gunfire but rather the comforting resonance of a horn sculpted by nature itself. "People in Bangui think that the Broto are dead and gone -- but they're still here!" exclaims Bruno Hogonede, head of the Ongo-Broto band, one of the last orchestras in the CAR devoted to the heavy horn. Carved from tree roots, with its origins lost in the mists of time, the horns of the Broto people, a part of the wide-ranging Banda ethnic group, play a ceremonial role. The instrument's earthy timbre is the sound of choice at traditional events and the Ongo-Broto used to perform in France, Algeria and elsewhere. But the ancient instrument faces an uncertain future. The CAR plunged into violence in 2013, destroying musicians' livelihoods. "The looters came, the instruments were destroyed in the fires," said musician Jean Noel Kilo. "We had to start again from scratch." "Broto musicians play at ceremonies, weddings, parties, funerals... but during the crisis, they didn't get many invitations," said Albert Kotton, director of the Boganda Museum in the CAR capital Bangui, which specialises in the nation's diverse cultural traditions. Walking down from the hill after the off-the-cuff rendition, Hogonede stopped in front of a hollow root emerging from the reddish laterite soil. "This is an opo root. The trumpet shape is caused by termites -- they hollow out the root from within," he said. "What I really like is that it's our ancestors who taught us this. And now I'm teaching young people in turn." In the past, young men learned to play the Broto horn as part of their initiation into manhood, a tradition handed on from generation to generation. 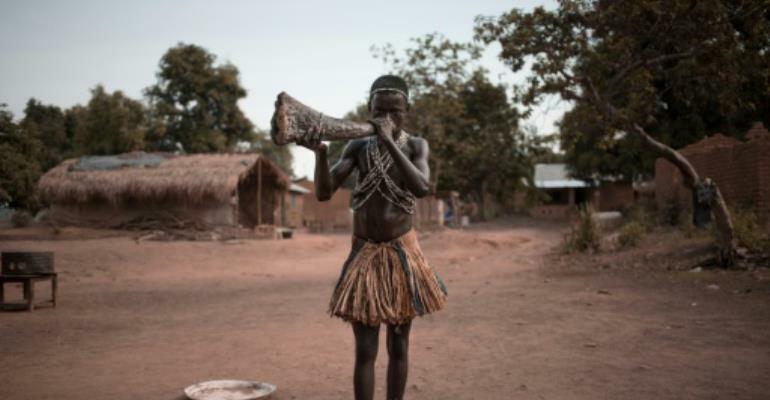 The role of the horn in the initiation ritual has faded away as younger children are taught the instrument and its strange overlapping sounds. The note and its overtones require extreme accuracy to deliver properly, for the pitch and feel of the sound depend crucially on the shape and width of the root. The Broto are one of about 50 communities in the Banda ethnic group, which is widespread in central CAR. Kotton, the museum director, said little was known about the ancestral origins of the Broto horn. One of the museum's treasures were a few tapes of horns being played that was made decades ago by an Israeli specialist in ethnic music, Simha Arom. The traditional role of the Broto horn "is quietly being lost," said Kotton. "What our ancestors used to do isn't what young people are doing today."